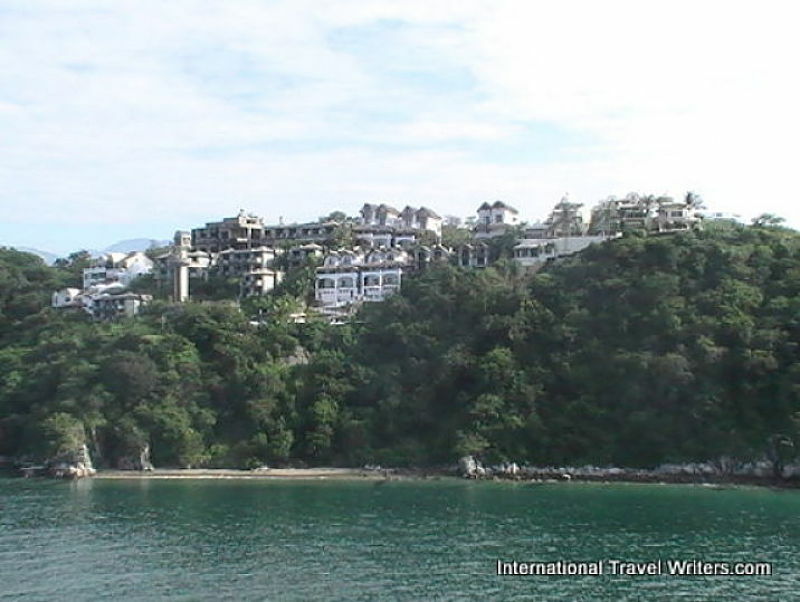 During the night our cruising to Panama voyage took us to Huatulco where we awoke to see condos lining the shoreline as we headed to the dock. 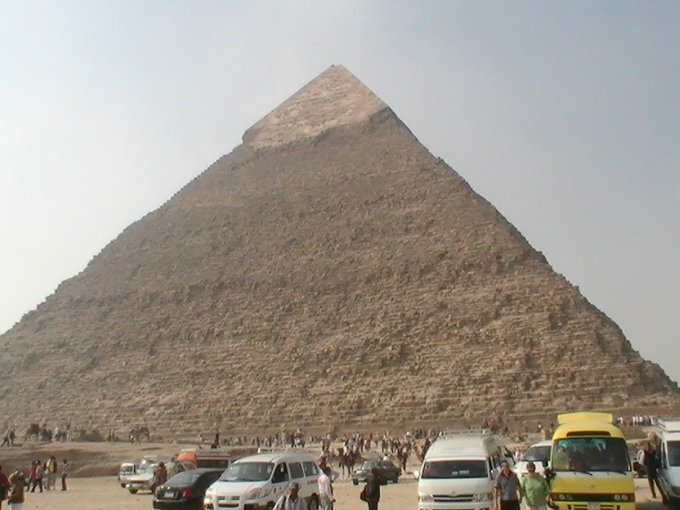 It is a tourist development in Mexico. It is located on the Pacific coast in the state of Oaxaca, south of Acapulco. Bahia de Santa Crus is the center of commercial and tourist activities with a large pier where cruise ships dock. 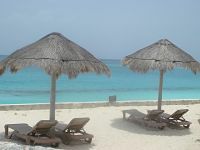 Playa Santa Cruz is the best known of the beaches here and it has white sand and turquoise blue water. If you are ever cruising to Panama this is a good stop with numerous optional tours. The Bays of Huatulco are made up of a series of nine bays and many small coves stretching along approx. 15 miles of jagged coastline. ATV Off-Road Adventure …navigate through tropical paths aboard an ATV. Goggles and helmet are provided. Must have a valid driver’s license. Temazcalli Prehispanic Steam Experience…A healthy and mystical traditional steam bath in a prehistoric spa decorated with replicas of the murals of Bonampak painted on the walls of the “Temazcalli”. Oaxaca's Towns & Villages …Discover the local culture, history and people of Oaxaca in 2 unique towns. Walk among the red, thatched roof buildings and visit the town church of Santa Maria. Relax with a cup of coffee in the isolated village of Pluma Hidalgo, located in the 2nd finest coffee-producing region in the world. A snack is included. Huatulco Towns & Traditions Off the beaten path you get a glimpse into Oaxaca’s and Mexican roots. Ancient Huatulco & La Crucecita…Experience the best of Huatulco. Visit Copalis Point Eco-Archaeological Center, the most remarkable archaeological find in the last 20 years, sightseeing the natural resorts beauty on your way to La Crucecita to shop independently for 45 minutes. 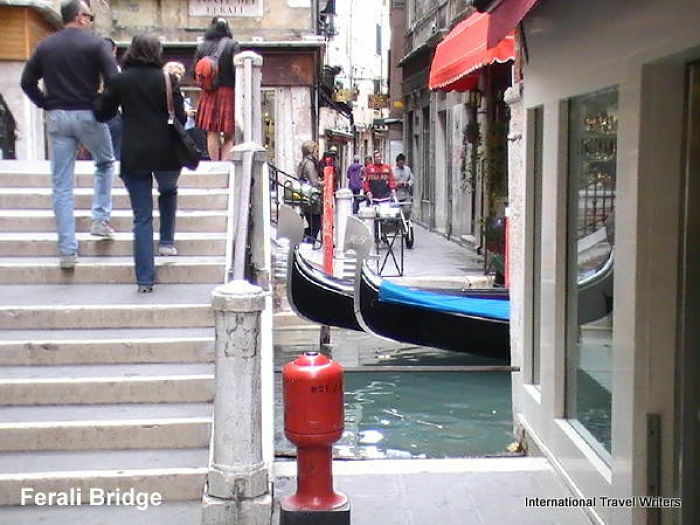 Walking Tour…This tour allows you to see La Crucecita at a slower pace. Most of the walking is in shaded areas and you’ll be able experience the garden areas of Huatulco, the Central Park and church dedicated to the Virgin of Guadelupe. There is also time to shop for handicrafts. Eco Tour and Crocodile Sanctuary…Experience nature and learn about the local ecology of Oaxaca. Travel approx.. 85 minutes through Oaxaca’s countryside to La Ventanilla Lagoon and Crocodile Sanctuary. Take a canoe ride through the vegetation of the lagoon and observe various species of wildlife. Visit an island where tree nurseries help the reforestation effort. Explore the island and learn more about the natural environment. Take a canoe trip to the mainland for the drive back to the ship. Tropical Flowers and Fruit Extravaganza…See an amazing array of flowers and fruit crops and have the opportunity to do a dip in a pond. A snack of fruit will be provided. Wear a long sleeve shirt, long pants, a hat, bug repellant and have good walking shoes. 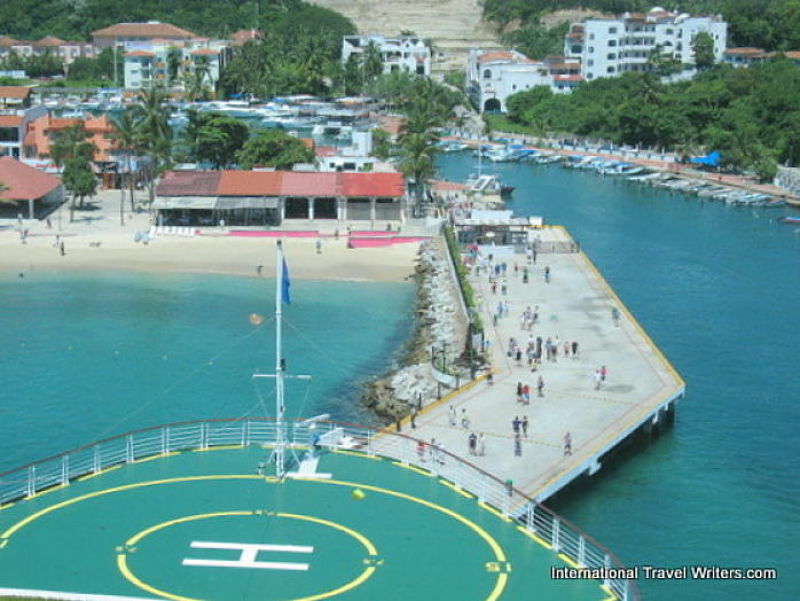 Huatulco Land & Sea Tour…Experience Huatulco by land and sea vising the downtown area of La Crucecita, its Central Park, the church and shops offering handicrafts. The tour continues on a catamaran to take in more highlights of the shoreline and “Bufadora”. Las Brisas Resort Beach Break…A Las Brisas day pass allows you to use the facilities and activities (swimming pool, beach, tennis courts, squash, basketball, volleyball and beach volleyball courts, snorkeling equipment and gym). Five Bays by Catamaran Cruise & Swim Go by catamaran for a sightseeing cruise to Organo Bay for swimming. Complimentary snacks and drinks are provided. Sailing & Swim Excursion…set sail aboard a 44 foot Cutter sloop and cruise some of the best bays. A 45 minute stop will be made for swimming. Margaritas, beer, bottled water and complimentary drinks are provided. Upon returning to the ship we'd continue cruising to Panama and the next stop would be Puntarenas, Costa Rica. Details of this port will be in the next segment of cruising to Panama.